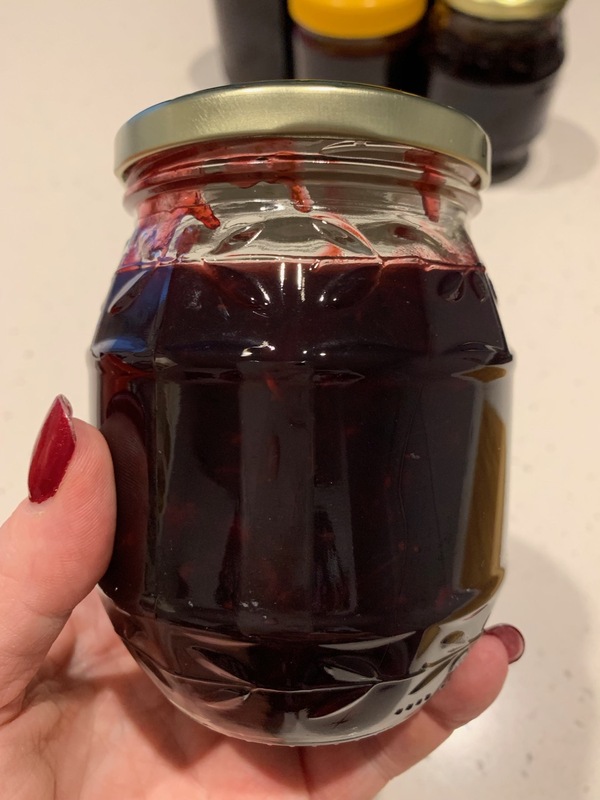 Today, I made Rosella Jam and I’m delighted to say, I had a tried and true recipe to follow thanks to my friend Muriel. Roselle (Hibiscus sabdariffa) is a species of Hibiscus and is thought to be a native of West Africa. Known as Rosella, or Rosella Fruit here in Australia, it is a wonderful source of Vitamin C and sought after for making jam. With a bittersweet yet tangy flavour, it is a favourite in my house, especially over the last few years as Dean and I have enjoyed – and fought over – jars that Muriel has sent our way. Last year I declared I would get some ‘fruit’ and make my own, and that’s exactly what I’ve done. I remember my grandmother making Rosella Jam, and I remember seeing the flowers in her garden so I can surmise that she grew and harvested her own Rosellas as well. I don’t have a Rosella bush, so I’ve had to buy some. Yesterday, Muriel and I visited a local farm to purchase some Rosellas. Where we found ourselves was CC’s Kitchen – home of The Big Rosella and, after a chat, and a look around, we left with our freshly harvested fruits. When I say local, I actually mean The Big Rosella farm that was more than ‘just a short drive out of Gympie’ as Muriel had told me. Gympie is the next town north from where we live and just over an hour away. That short drive from Gympie to the farm took another hour (almost), but the scenery was lovely, and so was the company and the conversation. At 10:30 this morning, my task began. 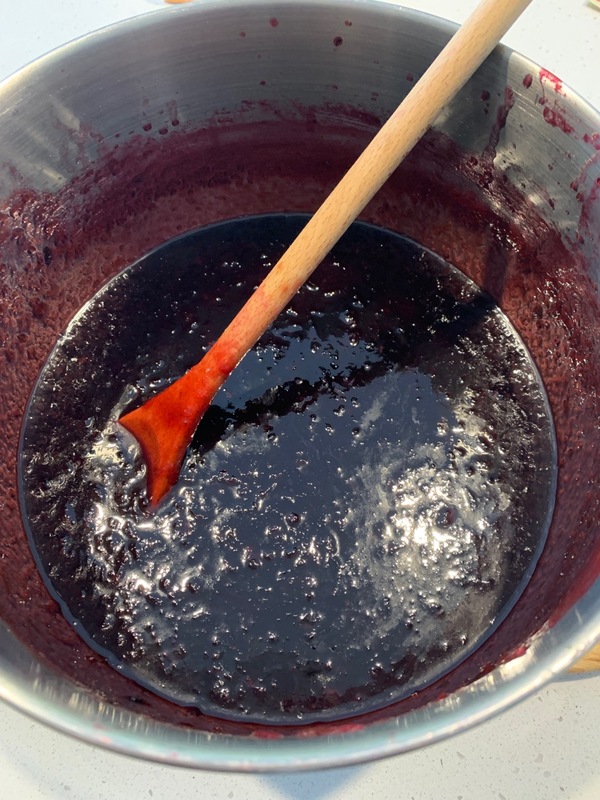 There are only four steps to making Rosella Jam. Step 1: Firstly, you have to remove the seeds from the calyx. The calyxes form after the flowers have bloomed and are the ‘fruit’ of the plant. I struggled a little with my hand not being a dextrous as it used to be following my broken wrist this time last year. I know I left a lot of flesh on the seed, but I have another batch to make, and I’ll try better next time. Before proceeding, I was both thoroughly and was glad I did as there was a fair amount of grit that the washing removed. Step 2: The seeds are boiled to create a pectin juice. Some recipes say to boil for about 50 – 60 minutes to break down the seed pods, but Muriel told me 20 minutes will be enough. I boiled mine for 30 minutes. This liquid is then drained, retaining the liquid, and discarding everything else – seeds and all. Step 3: The retained liquid, or juice, from boiling the seeds is then put back on the stove to boil and the calyxes added. This is where I thought I was in trouble. I used the biggest pot I own, but seriously, I thought my pot could have been bigger. I needn’t have worried though as it wasn’t long before they boiled down to make a gooey pulp. Again, this should take about 20 minutes. Here, I stopped after 15 minutes. Some recipes call for straining the pulp or pulverising it at this, but neither is necessary. This is a recipe for jam, not jelly. All those calyxes cook down to little, delightfully sour lumps. Step 4: (This is where I started making a mess in my kitchen.) The pulp is then measured, and cup for cup, sugar is added to the pulp. I had dollops of pulp all over my bench but eventually managed to get it back in the pot, with the sugar, and back on the stove and finally back to the boil for the third and final time. Muriel had said boil for another 20 minutes, however, I allowed it to boil longer, using the cold plate technique to test the consistency. Once I was happy, I took it off the stove. 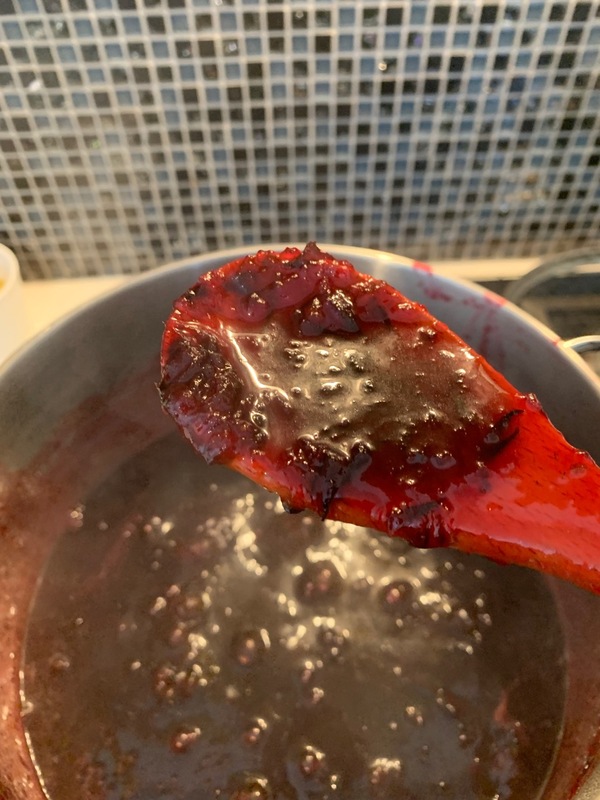 I did make an alteration to Muriel’s recipe – I added 1 teaspoon of butter and the juice of one lemon when the pulp and sugar were put back on the stove (and before they reached the boil). I saw several recipes online that suggested doing this, so I went with it 🙂 I also used a 50/50 mix of white and raw sugar. The end result looked amazing and the aroma was tantalising. Look at that gorgeous rich colour. Finally, I guess there is a Step 5: Bottle for later (year round) consumption. It took around 3½ hours for me to make this batch of jam, and now I have five large jars from 2 kilos of Rosellas. And neither of us could wait to try the fruits of my labour. The hot-crossed buns were reefed out of the freezer. They were promptly warmed up in the microwave oven. And buttered ready to add a generous dollop of jam. I think I’m on a winner. I have another 2 kilos of Rosellas, so I’ll remove the seeds tonight and cook them up tomorrow after work. I might even try adding something else to the mix – a little chilli perhaps – but I’ll decide on that tomorrow. Let me know if you’d like a downloadable recipe file and I’ll work on typing one up and adding it to my Recipes Page. Oh can you ship me a jar? A labor of love and yumminess! You are so correct! Looks so delicious! I enjoyed reading your post, I’ve wondered what Rosellas look like, I’m only familiar with the birds. I’m sure the jam is delicious it certainly looks rich. It is Sue. Thick and rich and tarty. In other words – really yummy. Just had some on my toast for breakfast. 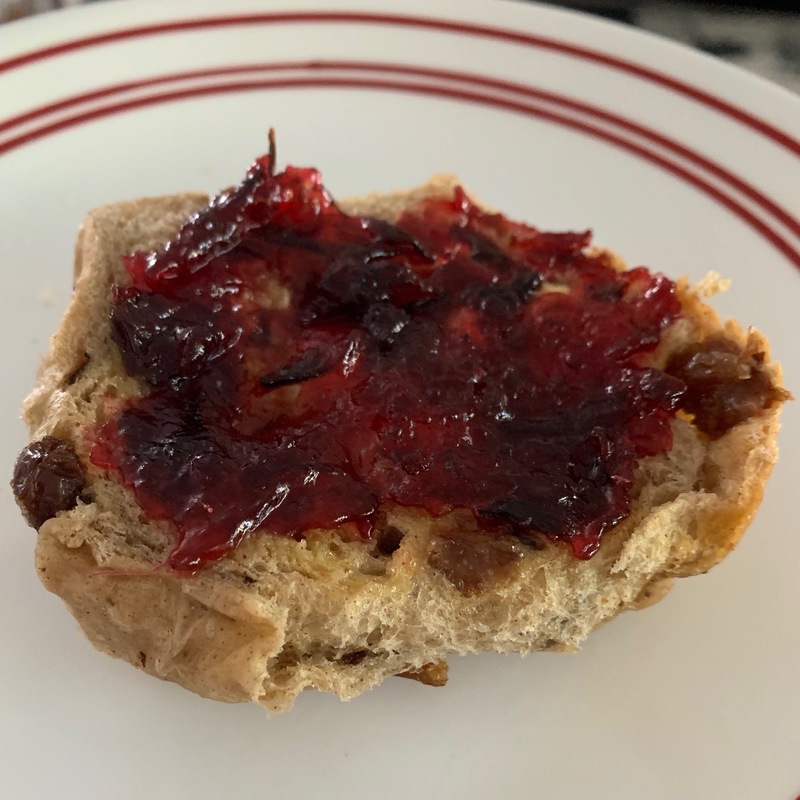 I think it is the best jam I’ve ever made – but I am biased.